Group photos can be fun and run smoothly as long as you plan properly beforehand. Here are 10 tips for great group photos. Ideally, all your group photos should be agreed with your photographer at your wedding planning meeting. I usually advise my clients to set aside about 45 minutes for group photographs. Most wedding schedules allow between one and two hours between the ceremony and the wedding breakfast. Around an hour and a half would be the average. So, if you allow 20 mins after the wedding for everyone to have a drink and congratulate the newlyweds, 5 or 10 minutes or so to corral everyone for a confetti shot you generally have a total of one hour to fit photos into. I don’t like to schedule all of this time as it is important to have a bit of leeway in case people disappear or are just difficult to round up. I prefer to work pretty quickly and keep things moving. Your guests’ enthusiasm can start to wane if things move too slowly. There are plenty of things you can do to make sure this part of the wedding runs smoothly, and is enjoyable for you and your guests. These are my top ten tips to ensure group photos don’t become a chore that frustrates you and bores your guests. 1.Make Sure You Have a List. The first step into making sure your group photos run smoothly is to agree a list of photos with your wedding photographer beforehand. Your photographer can guide you as to how long he thinks it will take and advise you if you have missed anything. If you are pressed for time in your wedding schedule the best way to make sure you run to time is to not have too many small variations in your list, or combine related shots into one larger group. For example, shoot bridesmaids and ushers as one group instead of photographing them separately. I always bring two or three hard copies if the list to each wedding. One for me and another for whoever is helping me round people up. 2. Start with large groups and gradually send people away. 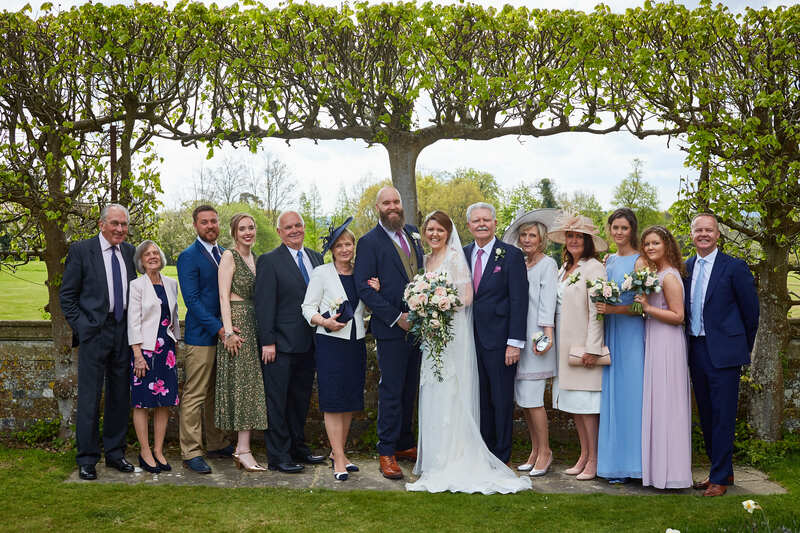 It’s usually best to start off with the largest groups as people are easier to round up just after the ceremony, and less likely to have wandered off. Also guests tend to be smartest early on in the wedding, and loosen ties and take off jackets as the day goes on. Things like that can be hard to spot in a group of 120 people! Whittle the groups down so that immediate family and closest friends are last, as they are usually the most invested in having photos taken with you. 3. Ushers and Bridesmaids are Best for Rounding People Up. I like to have someone working with me to round up the the next group of guests. At the same time, I can concentrate on the current shot. This should be someone who knows who most of the guests are. Say I need Auntie Mavis for the next photo. Someone who knows her can go and fetch her more quickly than an assistant. 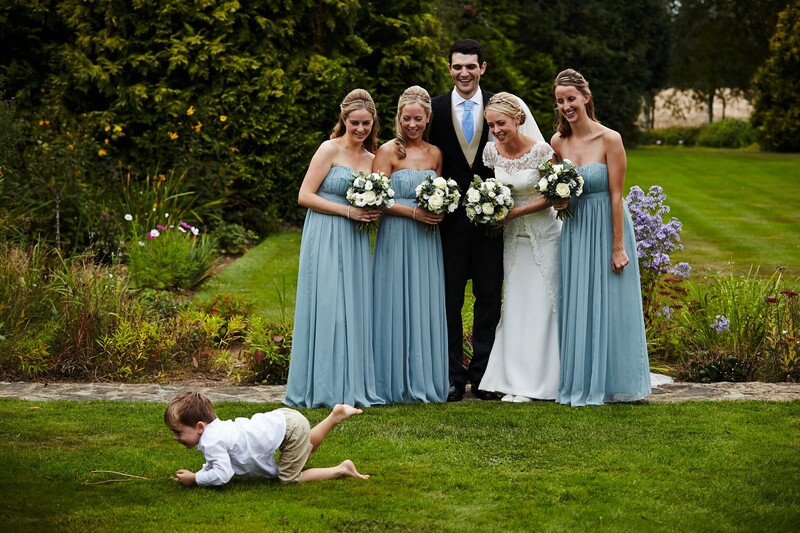 That’s why it is best to persuade an usher or bridesmaid to be the shot wrangler, it makes things a lot quicker. 4. Can People get Refreshments while they are Waiting? Whenever possible, it is better to shoot groups at the wedding reception where guests can get refreshments while waiting to be photographed. If I shoot group photos at the church I tend to work to a fairly short list and then complete them at the reception. This is especially true in the height of the summer. Don’t let people wait around in the hot sun without access to water. This is especially true if you have older guests or small children in the wedding party. 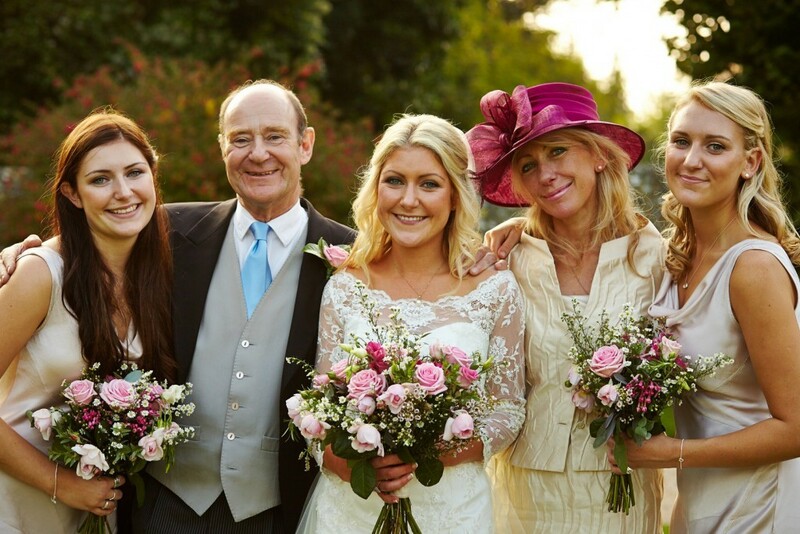 If you have elderly or frail family members at your wedding make sure they are photographed quickly. Don’t leave them standing around. If you can make sure there is a place to sit nearby, so much the better. 6. Keep your Shooting Location close to the Wedding Guests. This can be a real time saver. If the groups are shot even two minutes from where everyone is gathering it will take a minimum of four minutes to find that missing person or go and get a missing bouquet. This time can really add up if there are 20 groups to get through. Therefore, always make sure that your shooting location makes logistical sense as well as being nice to look at. 7. Make allowances for complicated family situations. Sometimes the bride or groom’s parents might be divorced or remarried. Often both birth and step parents are attending the wedding. In situations like this make sure your photographer knows exactly who is who. He or she doesn’t want to inadvertently cause offense or embarrassment. Sometimes this means shooting extra group photos so that everyone feels valued and included. Other times it just means carefully arranging individuals so no one feels uncomfortable. 8. If your list is too long – split it up. There is nothing that says you have to shoot all of your group photos in one long session. You can just as easily break the list down and shoot groups at different times during the day. Groom and Bridal parties before the ceremony, family after the ceremony, and friends after the meal can work well. Breaking group sessions down into 10 minute chunks can make them a lot more manageable. 9. Make sure you have a plan for bad weather. If you are unlucky and it rains on your wedding day, have a contingency plan. You might be able to use an indoor or sheltered are. Alternatively, have a decent supply of umbrellas, but having a plan will put your mind at ease. Nothing guarantees that it won’t rain on your wedding day like buying half a dozen white umbrellas! I often tell my clients it’s my job to worry and your job to enjoy yourself. Do all your planning beforehand and then let the professionals at your wedding look after you. That is what we are all here for. From my point of view, the happier the wedding party is, the easier it is to take great photos of them. Keeping you happy makes my job much easier! 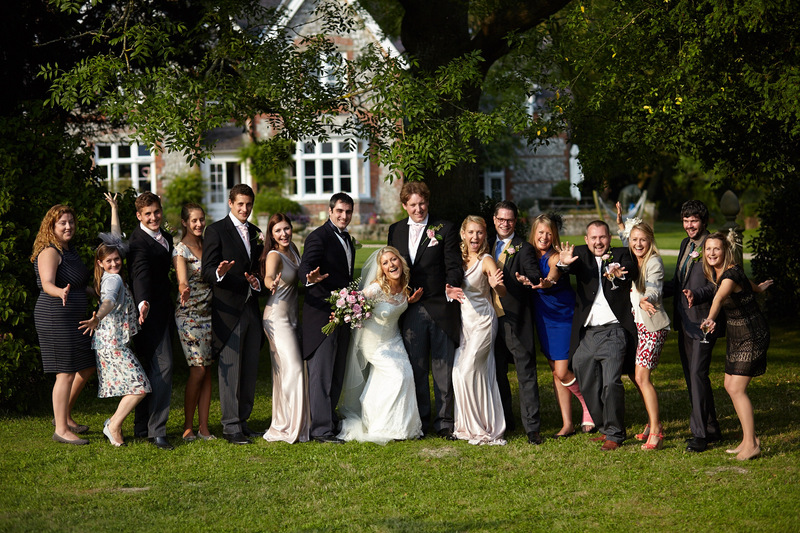 Tobias Key is a wedding photographer in Chichester, West Sussex. This entry was posted in Advice for Clients, Blog, Brighton wedding photographer, Chichester photographer, Chichester wedding photographer, Hints and Tips.